1. Delibird pokedoll. 2. Tomy delibird plush 3. Any Delibird charm! 4. 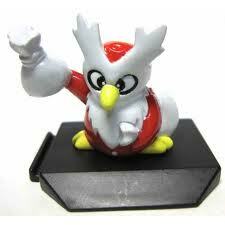 Delibird Tomy figure. 5. Delibird zukan. multipurpose post! poke box, gets, sales&auctions, & i spot pokegoods, so pickups maybe! WARNING: Image obese & text slightly overweight. Can't afford them all, but if you have one, we can work out a trade, maybe? <3 I can buy *some* of them now, I think. Desperate wants are in bold! If you have other eeveelution stuff you think I don't have yet, feel free to offer. I promise you that there is a LOT I am missing! 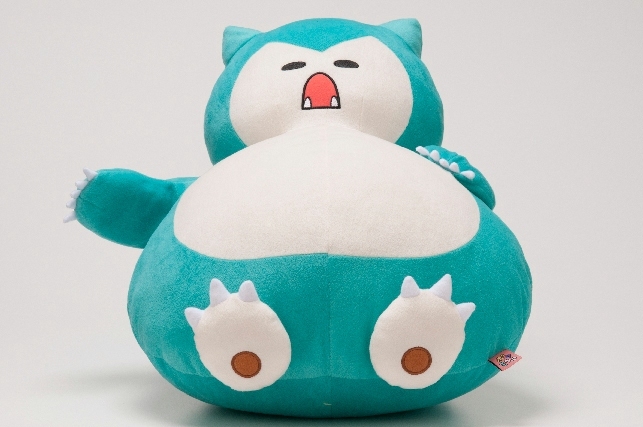 PokeMomo Goods + Snorlax Cushion Pickup Begins! Check out the stuff! Click to enlarge! After what happened the last time a giant cushion got announced, this time I am ready. Just comment to this post (just regularly - the special thread i made got screwed up ;_;) with your request to get your name on this list. Each doll will be 110$ shipped. Exact size dimensions are currently unavailable. Payment will be due anytime after August 11th. I will continue to pick up pillows each week and try to satisfy the entire list, even if it gets long. At the end of the day, I picked up and sent out over SIXTY WAILORD CUSHIONS. Let's DO THIS! In the event the doll is filled with bricks or some extremely heavy material, some additional cost may be added. THIS WILL PROBABLY NOT HAPPEN. But I need to put a warning here anyway just to be sure. The rest of the goods from this promotion, including new talky plushies and tomy figures and plush, are being added to Sunyshore regularly over the next few hours. Thanks folks! EDIT: All are added :) I will do a proper sale in the next few days, including rare old zukan auctions?! 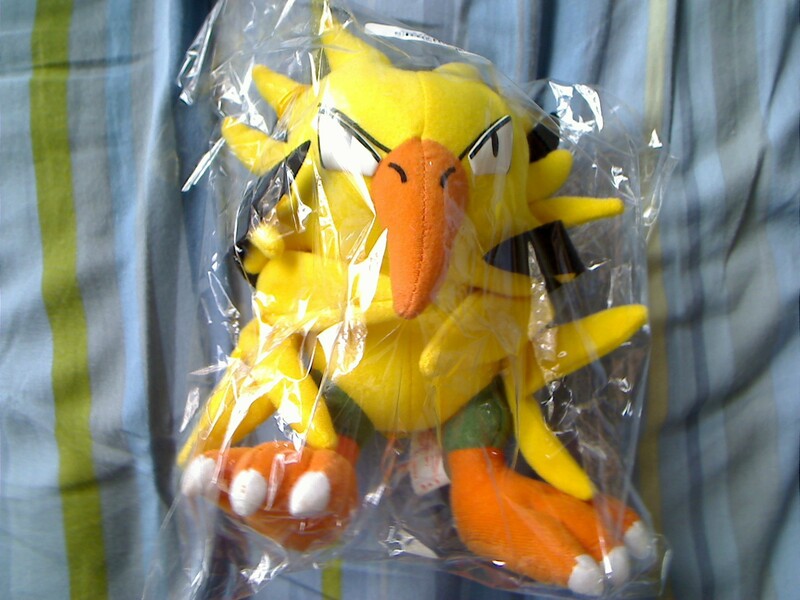 But don't miss the new tomy figures, the new tomy plush, or these new tomy plush also. Booya! Good afternoon! I'll be heading to Europe next week, so I thought I would clean up a bit to have some extra spending money! I have some gorgeous, impeccably cropped cell phone photos with some items that are looking for new homes! Please help me give them better owners! - Sales permission granted by lineaalba during the summer of 2009. Re-granted by denkimouse 26 June 2012. - I ship from Massachusetts, USA. I will ship internationally. - I can hold for 24 hours. If no further contact is received after the time has passed, the item(s) will go back up for sale/offered to the next person interested. - No haggling is allowed. - Please pay immediately since I am a bit pressed for time. Also! To those who participated in my clear Muskedeers GB: I have not yet received a shipping notice from the seller, but I am anticipating that the figures will be sent within the next few days. Your packages are already prepared; I just need to wait for the figures to come in! I will PM you when I need the shipping payments and will have them sent out as soon as possible. I leave next Monday, so if the figures arrive later next week, I will have a relative send the packages out to you, as I will be out for two weeks. Thank you, guys! Sales: Lowered prices & free shipping on US orders! Last night I realized that a holo Vulpix Topps card I kept seeing for sale was different than the one I already had! Apparently there are a bunch of variations - who knew? These ones were found on eBay but were priced a bit higher than I'd like to pay - does anyone have either of these variations for sale, or any others? I already have two, one where the lines on the card are raised and one where a few sparkles in the center are. Looking to pay $3-4 shipped per card, or I'd be happy to trade! Should I change some of them or do they seem good? Suggestions? Most of these I'm unsure of what to name them. I fail at coming up with unique names. Suggestions? I was able to get the clear zukans but just missed the chance to get the kid... so I'd love it if anyone could help! Delay in July Kids picked up + slight zukan "problem"
To everyone who has reserved kids from my July Kids pick up, I am really sorry about this, but when I went to the local shop last weekend, they said there's a delay in the July Kids stock >_> I have, however, asked them to phone me when they get the kids stocked, and they will be reserving 2 boxes for me. So don't worry, if you are on the list, you will get your kids, it's just being delayed x_x I am really sorry about this. Anyway, I was arranging my zukan collection the other day quickly, and noticed something is not quite right about my Mightlyena zukan. New Plamo Kits From Tokyo Toy Fair! Looks like we're getting lots of starters from many gens, the Legendary Dogs, Zekrom/Reshiram, SEVERAL White/Black Kyurems, Keldeo, Zorua/Zoroark, the Deino line, the Axew line, Pikas galore and more! Pikachu, Vulpix, Eevee, and Mew. They are my four fav Pokemon. <3 So, you know, if you have any items of these Pokemon, don't be afraid to tell me, (I may not be able to accept the offers right away lol) I have a random assortment of Pokemon stuff, plush, blanket, figures, cards, games, etc. When I get the time, I'll make a collection post. I was at Target today looking at the Pokemon stuff, and saw the same old Munna/Pidove/Woobat plushies, but next to them I saw these plush clip things. They had Pikachu & the Unova starters. 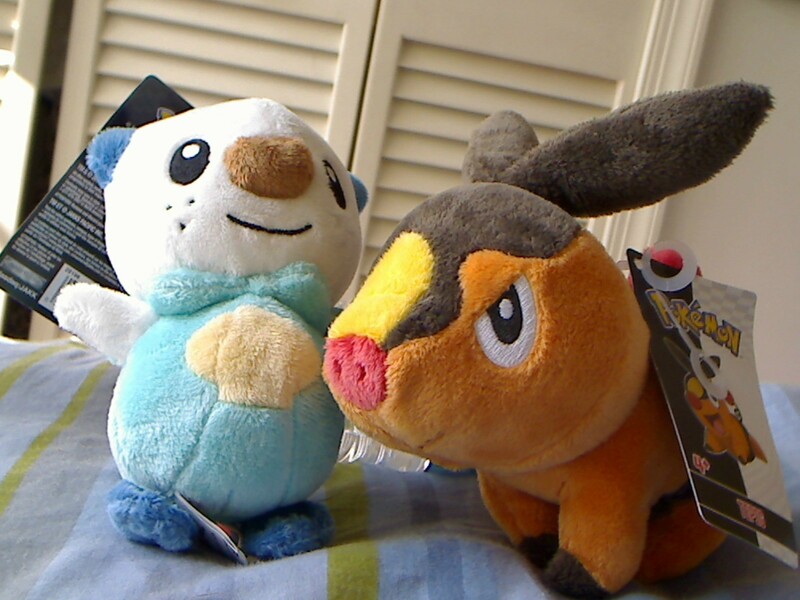 I of course bought the Oshawott one. 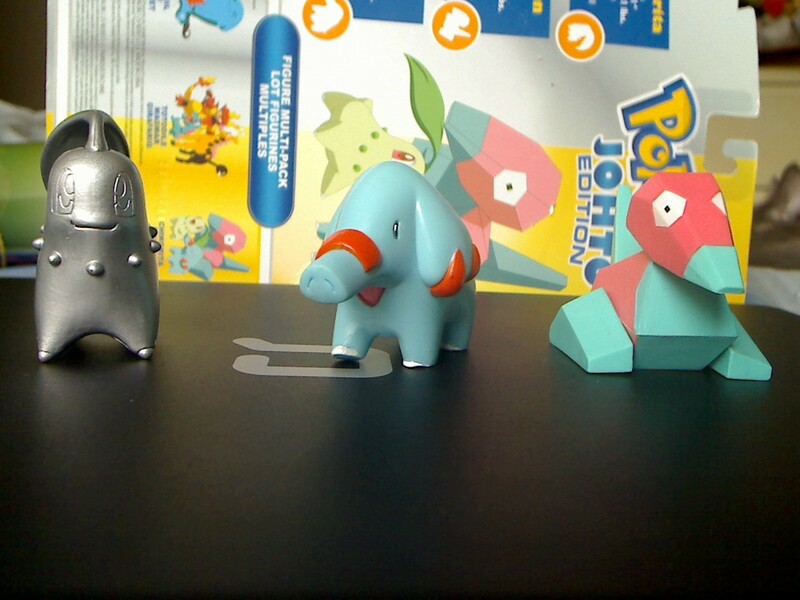 What you do is you pull the Pokemon down from the clip and it vibrates back up to the clip. I also saw the reversible Munna & Woobat plushies too. Is it a real collection now? Hello my name is Avery, I am new to Live Journal and I'm here because I love Pokemon. My favorite Pokemon is Raichu and I came across this community while looking for a specific Raichu Plush, the Super DX Raichu plush from Banpresto. 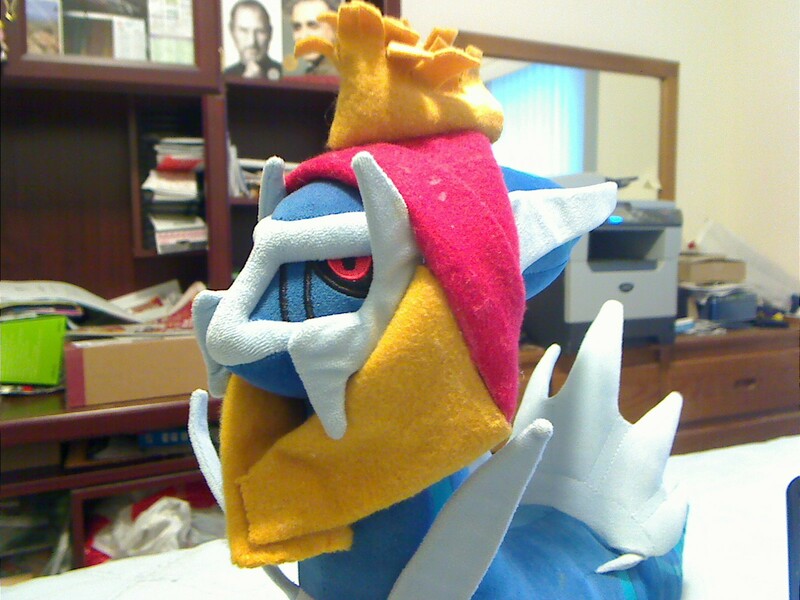 If you have this plush and are interested in selling it to me please feel free to contact me. I'm also interested in various other Raichu goods you may have come across. Thank you. Hello, everyone. I am japanese. I … I mean I should say the most of Japanese people are not good at English. I read the rule here, but I might misunderstand it. I would like to sell pokemon items here as other members. However, I have a problem. There is someone whom I can ask interpreting, but other members use many abbreviations or unknown words on different categories. In that case, it is hard for me to reply in a timely manner. I have a favor in order to feel safe and sell and buy smoothly and simply. I will introduce items that I would like to sell and prices at this category, but I would like people to purchase my items from my Facebook shop link after I place the link here. I list cheep price items on facebook. Please take a look when you get a chance. 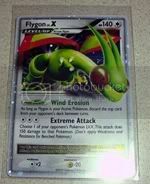 Hello, I'm MewtwoXWolf, the latest Mewtwo collector to join PKMNCollectors. Please, call me Wolfy. If I'm doing something wrong, please alert me so! I can be pretty forgetful. 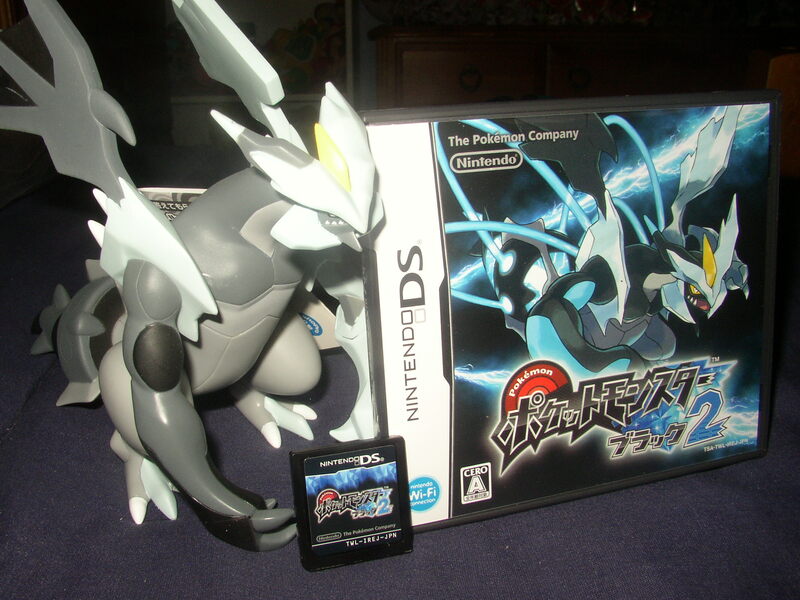 I am a newer Pokemon fan, I started actually paying attention in the DPP area. The first movie I saw was the first one (I watch them in order when possible, lol.) and I fell in love with Mewtwo, so I decided to accept the challenge of collecting 'em all! Only of Mewtwo, of course. I'd also like to start a few side collections, but I'll get to that later. Without further ado, my pitiful collection! The picture is crud, I'm aware. Thats what I get for using my webcam camera. You can't see them but I also have the Next Destinies booster package and the gold plated card. 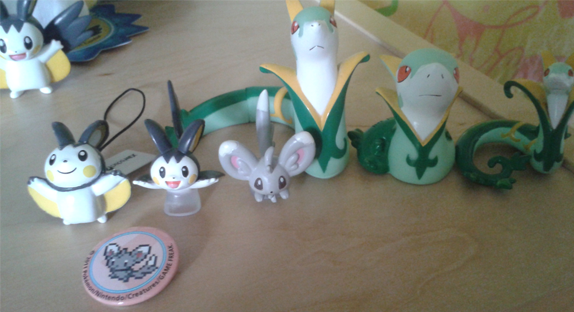 I have other Pokemon stuff somewhere, but I'm not about to dig it out. Heres a "close up" of Altaria. Her base is basically her flying through the clouds, and the blue part is the sky. Her pose fits in perfectly with the scene. Solrock and Lunatone's is pretty awesome! Alright, since I ordered two bases on ebay (without any Pokemon) I decided I should buy some base less Pokemon, and put them on there. Well, for this one, Solrock's side is a desert with two stones. And Lunatone's is the surface of the moon, and it has small craters here and there. Sorry I haven't been on the comm as much recently, although I don't know if anybody really even remembers me due to my lack of conversation or activity (I usually just lurk around despite being a member for three years now), plus there's so many new people here. 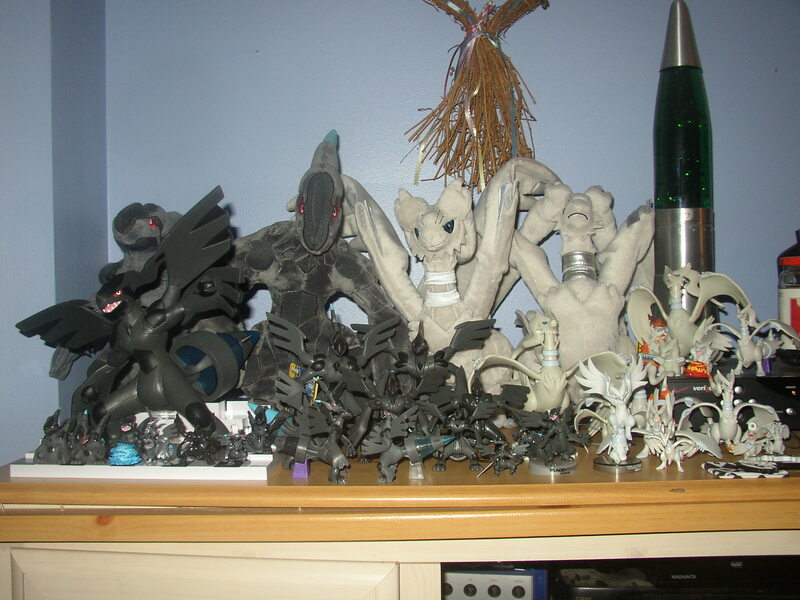 So anyways, I've been collecting Reshiram & Zekrom (as well as Kyurem, but it's collection is not the problem) lately, and I've been thinking about evening out their collections as much as possible, since the uneveness of it is bothering me (since I started collecting Zekrom first out of the three, so he has the most merch in my collection). So now I'm trying to catch up Reshi's collection to Zekky's. 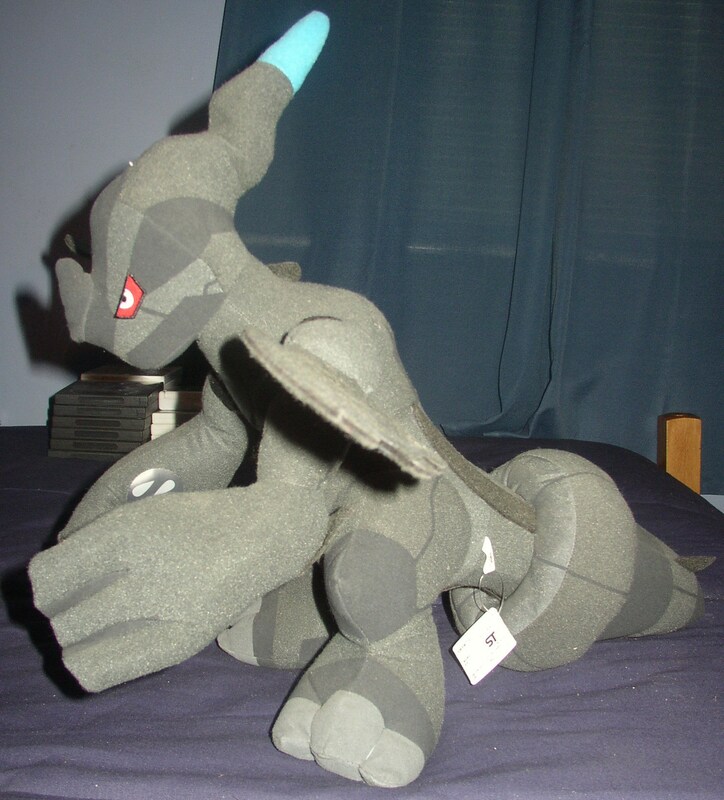 So, recently I've made the decision about letting go of two of Zekrom's plushies (since I'll more than likely not get them for Reshiram too). 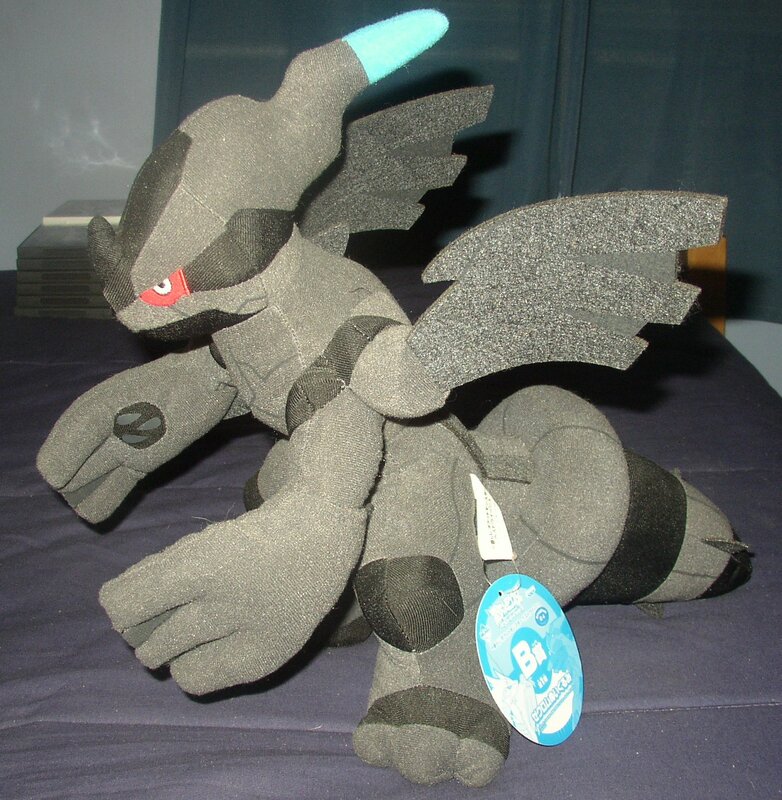 They are the Banpresto Ichiban Kuji Zekrom plush & the Namco-Exclusive Chotto Ookii Zekrom plush. This was a really tough decision to make since I really do love them (especially the Ichiban kuji one), but I just don't see myself hunting down matching ones for Reshi too (I already need to find the lotto figure for him, as well as some other small things). 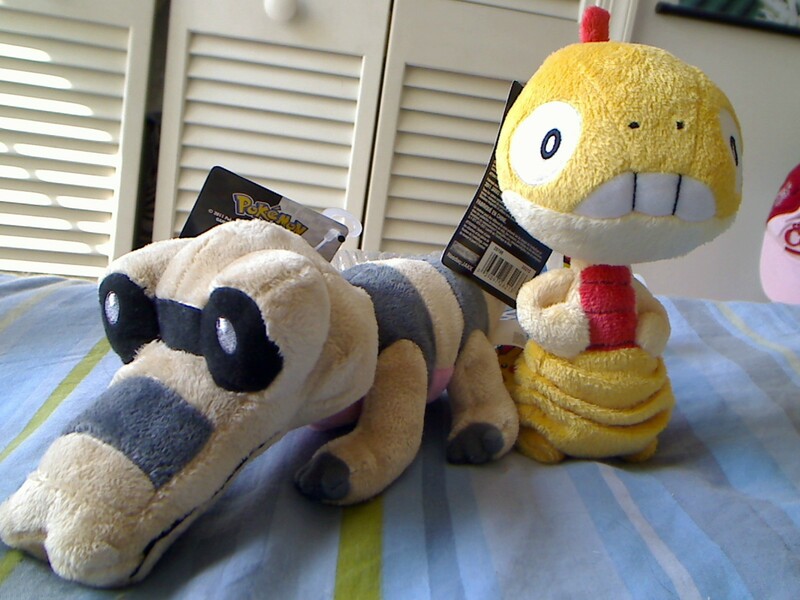 So these two will be in my sales post along with a few other non-Zekrom things today. Just wanted to remind you that my auctions will be ending tomorrow! Click any of the images below to be transported! Also, Friday is your last chance to get FREE cards! I added new items to my sales page. Click the pic or here to get transported. Also I have some things up for auction. 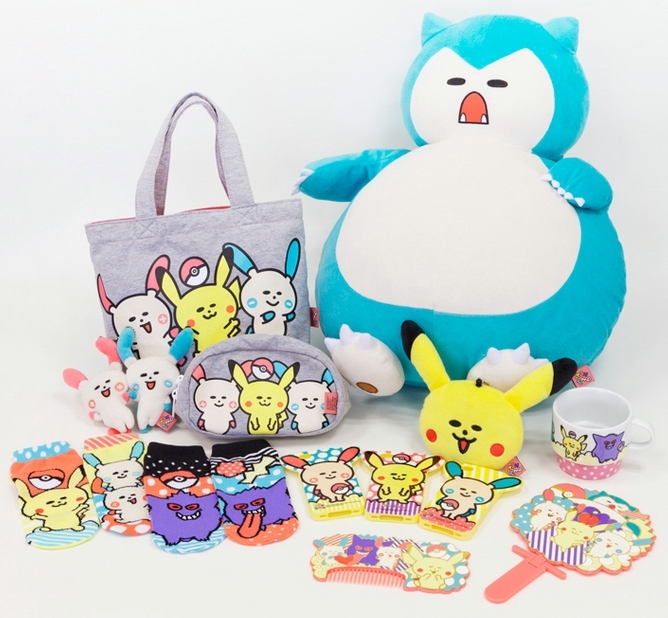 A poke box wallet, notebook, pokemon center wallet, an stationary set from the pokedoll stamp campaign. Ok as I was telling everyone yesterday I wanted to get kids figures for these boxes I want to make! I cant find good lots on ebay or even y!J for cheap or having a lot! I need figures badly! I need em cheap if possible and a lot of them with combined shipping! I dont even care if they are in horrible shape since I have paint here! I mainly want kids, but im open to see what other people might have figure wise that are cheap. I need a good list of pokemon, so i need eevees, legendaries, you know popular ones too! I need raichu too since I started a box for him already! If you could send me links for ebay, amazon, or whatever I would appreciate it too! But I rather buy from here! I rather not shop Y1J since I dont have an account yet and it will take me forever to get that done and I want these soon! Thanks so much guys! ...yeah. A single TOMY. XD Now, here's my AFTER!! Also, in the same line of legitimacy, I have these two Raticate figures - chibi stamper figures. One came with the base from a GA, the other from the same lot as a lot of my items. The one from the GA seems to have no issues, but.. this... other one.. help me out guys. Is this a bootleg of the stamper figure, or just a botched repaint job? ALSO the collection update continues! Later tonight I'm going to take photos of my Vaporeon and Charmander collections, and I'll add the link here to a separate post. They're small, but I have some interesting items! You'll have to take a look and tell me what I've got. Okay, that's it! ...Hopefully those cuts worked okay... Or else I'm going to have to mess with it for awhile... T-T Stoopid cuts... How do I use them... oh well. G'night everyone! Hello all! 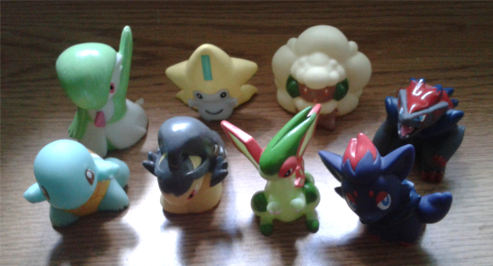 So I went to the Joker's Child today and snagged their pretty little pokemon kid figures. I got this (shiny?) clear slowbro and this Shiny hypno... but I have no idea what it is! !